A storm is blowing in off the ocean. The waves were high this morning, the sky is gray, and the trees are now bending their wide ever green branches in the wind. And the wind is cold. It’s time for soup. It’s also time for some soup for my soul. I’m heart broken beyond words to see our country using tear gas against women and toddlers seeking their right to request asylum. Besides writing to my Congressman about it, I went to find this story, Gate 4-A, by poet Naomi Shihab Nye, again, because I knew it would be the soul soup I most need. I was blessed several years ago to hear her read it in person. Sometimes, too, the outward activity of making a pot of soup reinforces the need my soul has for the miracle of softening, bringing together and harmonizing disparate forces. 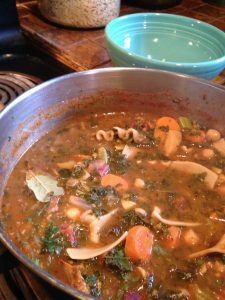 This particular soup uses up bits and pieces left over from a lasagna dinner that didn’t quite use up all the gluten free lasagne noodles, from Thanksgiving, and from the days it was warm and dry enough here to gather wild mushrooms. It’s a compendium of happy leftovers from the cupboard, the fridge and the freezer all in one pot. I trust it will help with what ails me on oh so many levels and I offer it to you in that spirit too. Saute the red onion in a large soup pot. I started on low heat while chopping everything else. After the onions begin to soften, add the rest of the raw veggies and some seasoning and saute for a couple of minutes. Splash with a little water if necessary. Then add the can of chickpeas (I did not drain it in this instance) and then the frozen chopped kale. After that is all stirred together and starting to warm, add the pasta sauce and leftover gravy and stir again. Then add water until you’ve got a soupy consistency, keeping in mind that once you put the lentils and pasta in, they will absorb some of the liquid. Once the soup is boiling, add some nutritional yeast, the little bit of lentils, and the broken lasagna pieces. Bring it back to the boil and let it boil a few minutes, stirring occasionally to prevent any sticking. Turn it down to medium and let it cook, continuing to stir occasionally until the lasagne pieces are done. Add a little lemon juice, some additional nutritional yeast and some chopped parsley. Take off heat and cover, letting it sit for a little bit. Stir and ladle into a soup bowl. Top with a grated cashew or hazelnut if desired for a parmesan cheese effect. Notes: this “recipe” is endlessly adaptable. Use whatever veggies appeal to you, and if you don’t have pasta sauce on hand, dilute some tomato paste, just something with a full bodied tomato flavor. The Italian seasoning I used happened to have red pepper flakes in it so I didn’t add any additional. It’s also likely it will need a little more liquid (water, pasta sauce) on reheating, since the lasagna pieces will continue to absorb liquid. Let your taste buds be your guide on all these options. This soup turned out much better than I thought it would when I was making it, the kind of good that makes my eyes widen and my mouth say, “oh MAN this is good!” It reminds me once again, that it’s absolutely imperative for me to put one foot in front of the other, even when I’m hearing old tapes that there’s no point or it won’t make a difference or turn out the way I wish it would. Nearly 30 years ago I used to ride my bike, the color of French vanilla ice cream, around the Back Bay to campus the last year I taught at UC Irvine before moving to Idaho. Something had gone wrong with the bike, perhaps a flat tire, and I had had to bring it in to the campus bike shop. It’s notable to me now that I can’t remember what it was, but I was in despair about something the afternoon I picked it up, so much so that it was hard to physically move. But I told myself to keep going, one step at a time, until I got to my car and could hoist it onto the bike rack and head home. What I do remember as if it were yesterday is that by the time I got to the car some of that despair had lifted, precisely because I had willed myself to concentrate on the task at hand, one step at a time, until I reached the car, rather than continue to be engulfed by whatever it was that had thrown me into despair. That focus on the moment-to moment literally shifted my consciousness away from feelings that were threatening to paralyze me altogether. It’s the going forward through a sheer act of will by continuing to make the motions that gets me across that river of fear, time and again. It’s not that I wish to forget about the parents and their children suffering at the border; that’s something I’ll likely never forget, unlike the personal details of the despair that day as I walked to retrieve my bike. It’s that I wish to be able to go on in service to their humanity, however humbly I am able. I’m grateful for the difficulties I’ve had in my life that taught me to do this, and the moments of grace that help me remember to apply it, even in seemingly tiny ways. It’s the resonance of that compassion and determination moving outward into the world I believe in. And so I go forward, with my letter to my Congressman and my steadfast belief in the humanity of every human being, because I never know what continued motion in that direction will be the tipping point. I know that every one of those steps counts, is a light against the dark in and of itself. I make soup to help me keep taking those steps, even when I have to will myself to do it. The fear that soup wouldn’t be any good as I was making it turned out to be false. I hold fast to that, too, because it means the same outcome might apply to the much larger collective challenges we face. That possibility is delicious soup for my soul. So I put one foot in front of the other and I trust in that. As always it was a pleasure reading your message, thank you! Love your recipes & appreciate them too; can hardly wait to try this one. 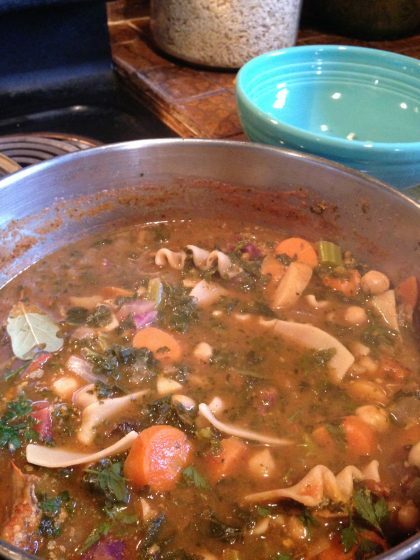 I know my husband will enjoy it because it’s got many of the veggies & pasta he enjoys best! I’ve given you a “new email address (above) so please remove the old one (testarosa@embarqmail.com). Thank you for giving me a smile for the day. Oh, before I forget, I agree with you comments about the poor folks at the border. We all want to have the best life we can and they are no different. So very sad. Thanks so much, Marcia! I’m happy you enjoyed the post and look forward to making the recipe! I think if you put in a new email address that it will automatically change, but I don’t know for sure. Susan does all the technical stuff so I will ask her. And a heartfelt thank you for your compassionate comment about the people at the border. I love what you said about all of us wanting the best life we can have. We as nantion need to do WAY better at following our own laws regarding asylum and true humanitarian ideals. Marcia, I just checked with Susan. She will remove your old email address but you need to resubscribe on my blog’s page with your new one if you haven’t already. Hope that makes sense. Thanks for your readership!